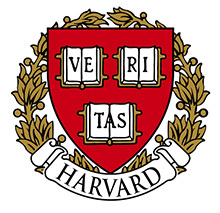 The omni-present Veritas motto on Harvard University's campus may never have been tainted more than by the scheduling of a Satanic "black mass" for May 12, 2014. The President of Harvard's attempt to explain why the presentation would be celebrated on the campus was certainly an embarrassment to those who attempt to portray the University as a bastion of higher learning. Drew Faust tried to tightrope walk between calling this desecration of the Roman Catholic Mass as "abhorrent," while defending "freedom of expression." Once again, in Harvard's eye, Roman Catholic worship is fair game for insult while they tremble, as they should, at any attempt at desecration of Jewish or Muslim religious ceremonies performed so often in the Greater Boston area. Yet, she never rescinded the approval, let alone admitting that our highest court has affirmed that the lst Amendment is not absolute. Clearly she should have denied the Satanic group from New York permission, well aware that the essence of our freedoms is often best defined by their limitations. Fortunately, the event collapsed of its own weight, as our memories were tested to recall such a broad response from the local Roman Catholic community. From Aurora Griffin, a Harvard Rhodes scholar who gathered over 60,000 protest signatures against holding the event, to an emotionally-choked pastor asking for prayers from the pulpit after celebrating Mass, indignation was legion. The height of embarrassment for Harvard had to be President Faust's announcement of her intent and eventual presence at a Holy Hour conducted at nearby St. Paul's Roman Catholic Church. While not participating in the Eucharistic procession from MIT's chapel to St. Paul's Church, she was pictured in a pew at the Holy Hour which followed and which was attended by an overflow crowd. The Holy Hour is a highly reverential Eucharistic ceremony, spiritual and participatory, not one to be used as a photo op. She chose the latter path. The Satanic Temple's "black mass" did not make it to the Harvard campus, only because of the thousands of Roman Catholics who peacefully gravitated to Harvard Square, and who were joined by countless others in prayer throughout the area. It collapsed internally. While the media coverage was extensive, it was short-lived because of its blatant anti-Catholic transparency. From Harvard University to the Satanic elements involved, this effort was rebuffed by the response of loyal Roman Catholics. It was proof that they are finally seeing evidence of the Secular Fundamentalism espoused within these ivy-covered walls. 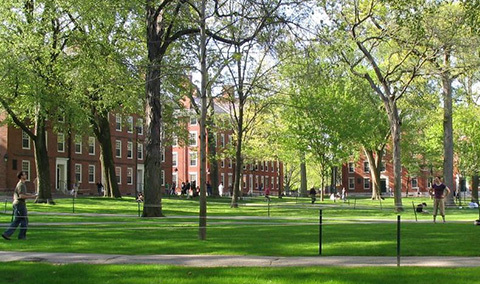 Harvard has long since been spading up its Christian roots which go back to 1636. Veritas Christo et ecclesiae, the complete motto, prevailed in Harvard Square and environs, if only for a short time, but on May 12th it was edifying. The Secular Fundamentalists still have nothing approaching the solemnity and spiritual power of the Roman Catholic Mass or Eucharistic Holy Hour. 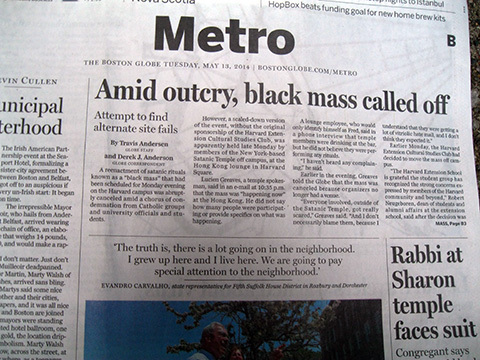 The Boston Globe relegated the Satanic Temple's failure to re-enact their "black mass" at the Harvard Cultural Center to the paper's Metro section. It appeared above a story about a local Rabbi who had admitted that he had "engaged in marital infidelity and other serious personal conduct which requires me to resign." One could not help but wonder if those stories would not have been reversed and on the front page, if the second story had a Catholic priest involved. 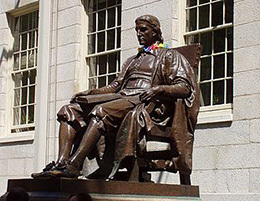 Commencements and the ending of the academic year provide perfect cover for Harvard's loss of a major skirmish in the Culture War, but re-grouping as summer approaches is surely high on their agenda. Harvard does not enjoy having its hypocrisy so clearly exposed. The true test of the strength for the Roman Catholic religious community, however, will be to see if complacency does not set in again. Evil does exist! It was quite evident in Cambridge in May 2014 and it calls for eternal vigilance. Veritas Christo et ecclesiae is a powerful expression.